The voice in my head is winning. I refuse to say that term in our office. Information governance has joined “records management” “platform” “metadata” and the myriad other terms destined to be met by the rolling eyes of my coworkers. Don’t ask me to champion this cause because doing so just strengthens their opinion that I don’t get it. I do get it. Those people have a job to do, a business to run and the documents and information artifacts that are consumed and created by those jobs are simply that – artifacts. Artifacts to be curated by someone who cares. Do those artifacts have value? Of course they do, and they are paying my department to bring that value to the table. During his opening message at the AIIM Executive Leadership Summit on Information Governance, John Mancini mentioned that one of the AIIM Board members had said “Information Governance is like my check engine light.” The comment invoked a mix of facial expressions that made me glad that John hadn’t identified me as being that Board member. I wrote about that comment on my other blog in a post called for the love of black boxes. I’m going to abandon that analogy here. I’m going to make one that the InfoGov folks will like even less. Information governance is like recycling. When our little town in Connecticut started talking about recycling, it was a “save the planet” mission. There was lots of education, lots of discussion and lots of work for the precious few who tried. Recycling meant warehousing garbage collecting bags and boxes of neatly separated stuff before trucking it to bins behind our Public Works building. Very few people participated in the program. Most of the stuff just got hauled out to the curb with the rest of the trash. Tell me you haven’t seen an analogous situation in the information governance space. Next, we moved to single-bin mode. We had our own bin, where we put newspapers in a bag, cardboard tied in bundles and cans and bottles loose in the bin. We had to carry the bin to the curb, and lots of stuff was left in the bin because the town only recycled certain plastics. Then, a few years ago, we went totally single-stream – everything in one big wheeled bin. Oh yeah, I’m recylcin’ now baby. Templates – We have a few solutions where we have tied templates to content types so that people can create documents in the library where the completed documents belong. 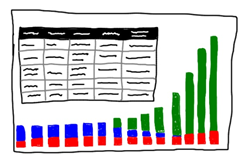 The governance stuff is built in and nobody actually has to do much work. ShareFile – Our decision to start using Citrix ShareFile was actually when this blog started to change its identity. Yes, ShareFile relies on folders and naming conventions to identify things, but I don’t see it as a step backwards. We are using it to share content with people outside of our organization. 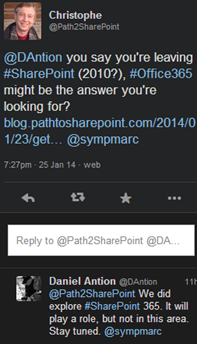 So, instead of people clandestinely avoiding SharePoint, they are happily embracing ShareFile. Give ‘em what they want! We have one set of documents, they are in our cloud and there are apps for everything. You could use any other cloud-based solution (Box, DropBox, Google Docs, OneDrive or iCloud). The point is, the solution has to meet the user where they work. Find a way to govern that solution and aid the business process instead of impeding it. Services – These are black boxes of a sort, nobody sees the content, they only see the results, the information that they need. The most recent example of this is a survey we are about to conduct. The people who are interested will see the results, organized the way they want, but that’s it. We’ll take care of the bits of metadata needed to organize the results. We’ll take care of the permissions, the retention, the privacy and security around the ‘personally identifiable data’ and we’ll take care of all that other stuff nobody else cares about. They won’t know that their information is compliant with regulations and in keeping with the policies our company has established. They won’t know, and I won’t tell them.